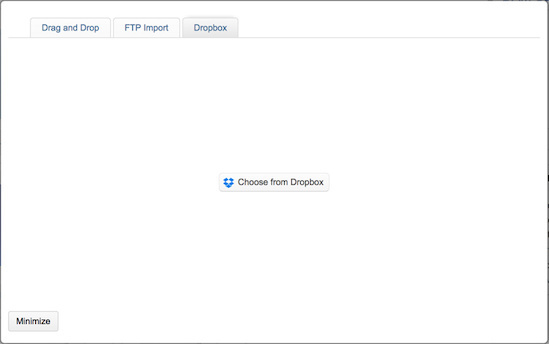 The Dropbox Integration makes it easy to move files back and forth between Webdam and Dropbox. You can use it to quickly centralize assets stored in various personal Dropbox accounts and distribute files to people who don’t have access to your DAM. This integration is available to Enterprise and Professional users with download and/or upload access in Webdam core, but first must be enabled by your admin. Click in the top navigation and select System Preferences. Click an asset to get to the asset details page, then click in the actions toolbar. The first time you choose to send an asset to Dropbox, you'll need to click Add Integration. To send assets from Dropbox to Webdam, you'll need to have upload permission in Webdam. Click Upload in the actions toolbar. Note: If you do not see the Upload option, you may not have the appropriate permissions to upload (ask your Webdam admin to change this setting) or you have not selected a folder. Select the asset(s) you wish to upload to Webdam and click Choose. Note: The newly uploaded files will appear in the folder as Asset Processing while the preview thumbnail is being generated. Is there a filesize limit on Dropbox uploads to WebDAM? We use ftp when the filesize is too large for a regular upload (from local file storage) to WebDAM, is there a similar filesize limitation using Dropbox? The Dropbox intergration is limited to 5GB per file when transferring. FTP is generally the best route for large files, with support up to 250GB.